In a slender volume that contains multitudes, the award-winning critic and novelist details his travels in such far-flung places as Tahiti and the Arctic Circle. In the author’s note, Dyer (Writer-in-Residence/Univ. of Southern California; Another Great Day at Sea: Life Aboard the USS George H.W. Bush, 2014) proclaims the subsequent “chapters,” for lack of a better word, are “a mixture of fact and fiction…the figure at the centre of the carpet and a blank space on a map.” Prefacing each chapter with a brief anecdote relating to a physical landscape of memory—e.g., a rock formation called Devil’s Chimney at Leckhampton Hill that his uncle climbed—Dyer creates a pictorial framework for his digressions on place and culture. (There are also photographs throughout.) Referencing D.H. Lawrence’s use of the term “nodality” and how certain places feel “temporary” and others “final,” the author inflects his musings on place with a mystical quality as he recounts experiences tracking Paul Gauguin’s footsteps in Tahiti, a trip to upper Norway to see the northern lights, and a pilgrimage to Theodor Adorno’s Brentwood, California, house, among others. The two standout chapters focus on Dyer’s adventures experiencing Walter de Maria’s The Lightning Field and Robert Smithson’s Spiral Jetty, both landmarks of the land art movement. Though the author’s travels are diverse, he has an outsized fascination with the vastness of the American West. However, his interest in landscape goes beyond a sacrosanct connection to the Earth. 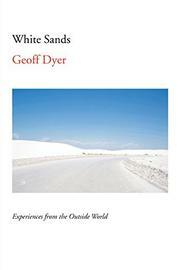 With philosophical incisiveness, Dyer extols the virtue of landscape to conjure in himself the tangible and the mirage, the real and the illusion, the possessed object and the desired object. There is an undeniable joy throughout Dyer’s writing, an affirmation that travel and the experience of place—not merely being someplace, but being present in it—is a gateway to the humanity of past, present, and future. A mesmerizing compendium that reflects on time, place, and just what, exactly, we are doing here.